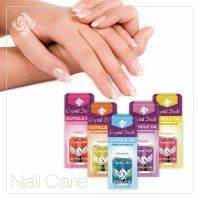 Natural nail treatment products and Crystal SPA products for the perfect and healthy nails and skin!Crystal Nails nail care products: Ridge Filler, Top Coat, Hardener, Defender, High Shine, Top coat, Cuticle Remover, Anti Fungus, Cuticle Oil, Teatree Oil. The nail- hardener base coats contain different vitamins and mineral additives. (calcium, titanium, protein...etc).